Interlaken is considered the adventure capital of Switzerland, and it’s not hard to see why. Nestled between two lakes – each distinctly beautiful in its own way, with the brilliant turquoise of Lake Brienz and the calmer blue of Lake Thun – Interlaken is a place where nature reigns supreme. The mountains that surround Interlaken ofter several opportunities to get high, whether it’s on adrenaline from a paragliding flight over the beautiful Swiss valleys or on altitude from one of the many beautiful peaks near Interlaken. 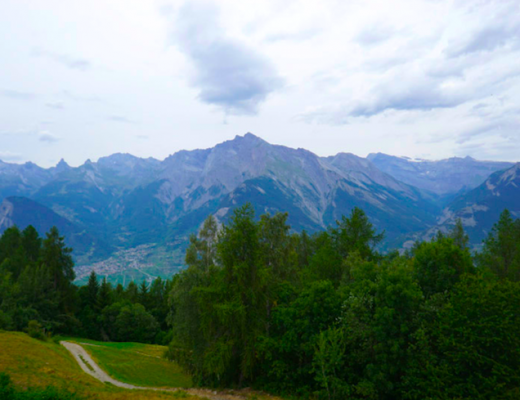 Here are a few of my favorite day trips from Interlaken! Lauterbrunnen is so beautiful that honestly, it deserves a spot of its own on any Swiss itinerary. However, I know time is limited for many people and therefore, a day trip from Interlaken may be all they have time for. Luckily, Lauterbrunnen couldn’t be easier to get to from Interlaken. It’s a quick 30-minute train on the Bernese Oberland valley railroad through mountains lined with glacial rivers and captivating views. 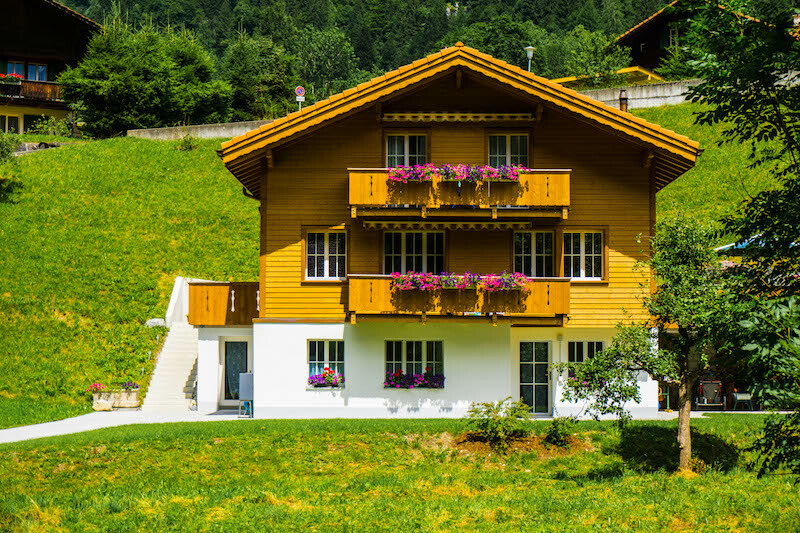 My favorite thing to do in Lauterbrunnen is simply checking out the traditionally Swiss gingerbread-looking houses, made of wood and with flower boxes bursting with colorful blooms in the summer – it’s really a photographer’s dream. There are also two waterfalls right in town which are both well worth seeing for yourself – they comprise just two of the 72 different waterfalls you can find in Lauterbrunnen Valley. A 45-minute walk or a short bus ride outside of central Lauterbrunnen and you can find the powerful Trümmelbach Falls, a series of 10 different glacial waterfalls, many of which are located inside a mountain. These waterfalls are insanely powerful, churning tunnels through the mountain, and are truly a sight to behold. 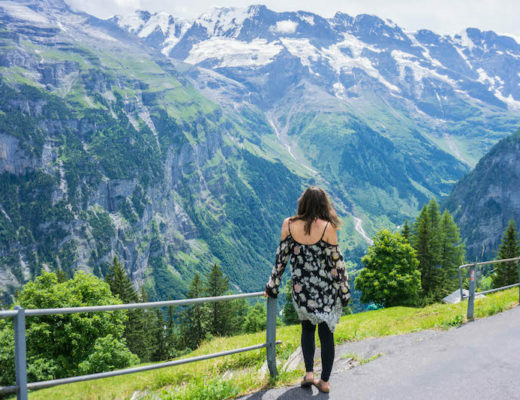 If you want to get away from Lauterbrunnen, and sneak in a day trip on your day trip from Interlaken, I also recommend taking the cable car and train up to the scenic village of Mürren, a beautiful car-free village tucked away up in the mountains. 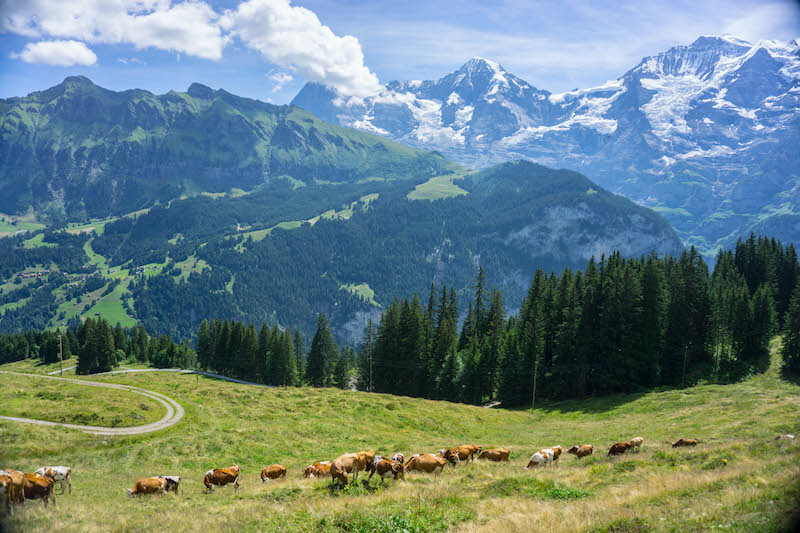 From there, you can also visit Gimmelwald, another beautiful village accessible by cable car or by foot, which is also quite easy to visit from Lauterbrunnen, so it’s possible to do all of the above in one quick-paced day. Another one of my favorite day trips from Interlaken, it’s quite easy to take the scenic cogwheel train up to Schynige Platte, a beautiful mountain that overlooks Interlaken. Starting from Interlaken, you can take the Bernese Oberland Express train one stop to Wilderswil, and then take the adorable red train about 1 hour up the mountain, taking in gorgeous views of Interlaken valley from your train window. At the top of Schynige Platte, there’s plenty to do to while away an afternoon. You can eat at the restaurant there enjoying the views, or simply sit at the café and enjoy a coffee or glass of wine if you are on a budget. 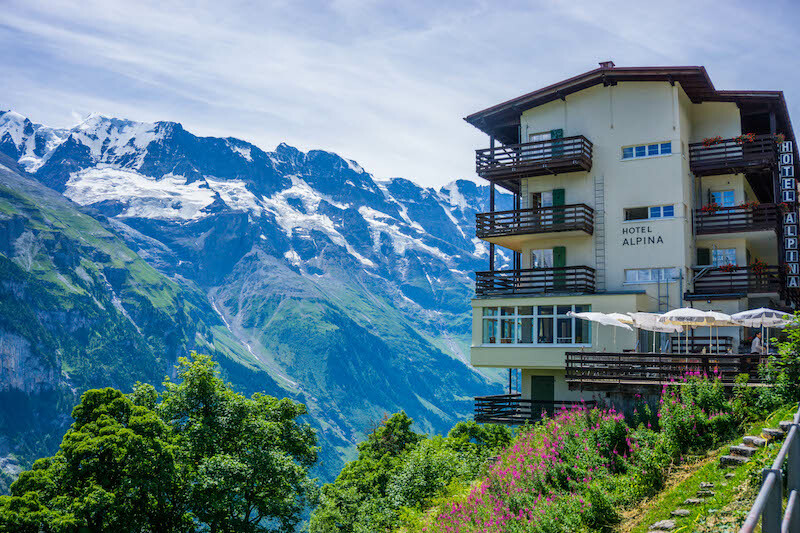 Either way, you’ll enjoy a view of the triple peaks of Eiger, Mönch, and Jungfrau. 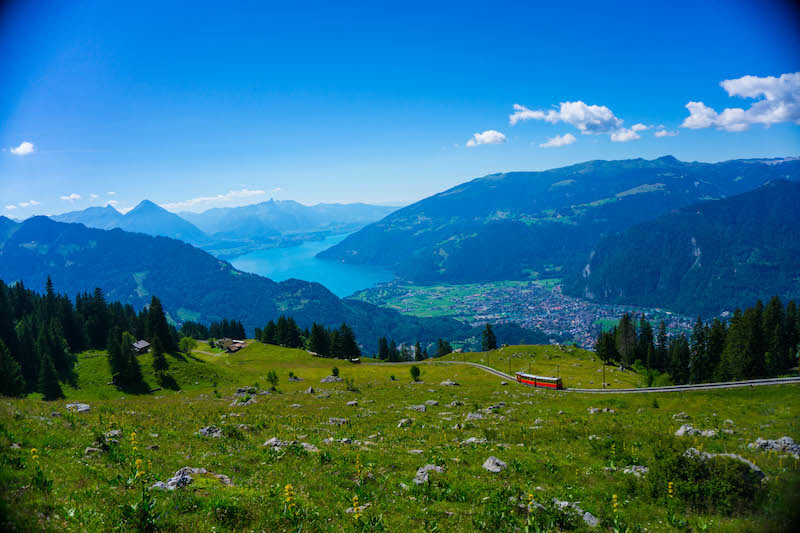 There are hiking trails you can take in order to get beautiful views over Interlaken, or if you’re after a more restful day, you can just kick back and enjoy the scenic train ride. For more information on the train ride, check out their official website here. 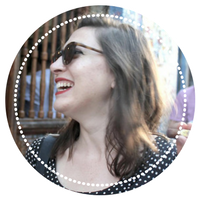 If you’re intrigued by the idea of climbing to the “Top of Europe” – without having to do much more than sit on a scenic train (where my fellow lazy people at?) 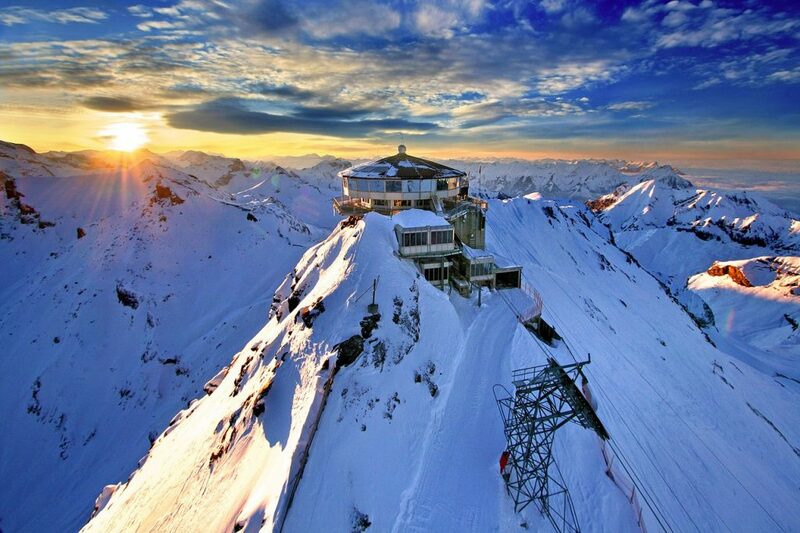 then you’ll love visiting Jungfraujoch. This is the highest railway in Europe, taking up to nearly 3,500 meters above sea level (more than 10,000 feet). It’s also a UNESCO World Heritage sight, if you’re a collector of historic sights! At the top of Jungfraujoch, you’re able to see a handful of peaks over 4,000 meters tall all around you, as well as the ancient Aletsch glacier which has survived millennia and is still the largest glacier in the Alps. There is a year-round Ice Palace, carved by artists to create a wintry wonderland that will delight kids and even adults with ice sculptures taking the forms of animals. 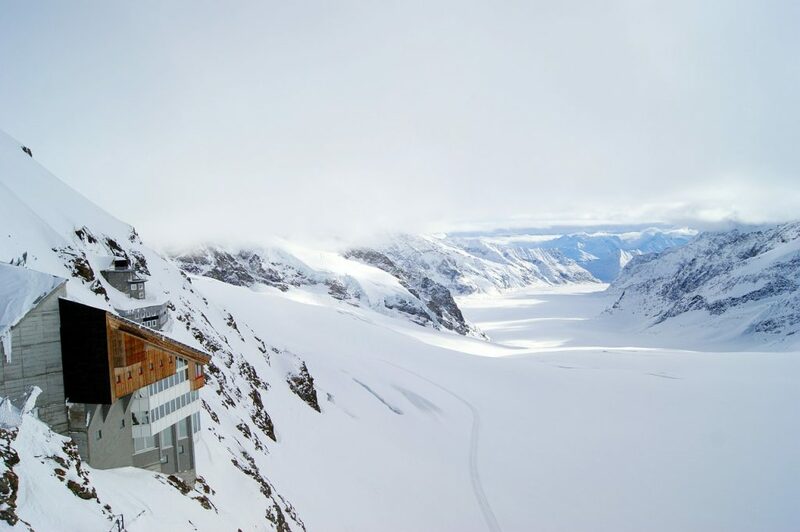 While the view at the top can sometimes be obscured by the clouds (you are 3,500 meters up, after all – clouds are often a given) there is the Jungfraujoch panorama which gives you an immersive, cinematic experience of the snowy peaks and vastness of the glacier. I recommend visiting Jungfraujoch as part of a guided tour that includes transportation to Grindelwald, the scenic train ride up to Jungfraujoch, a stop in Wengen and finally a stop in Lauterbrunnen, allowing you to see the most on your day trip from Interlaken. Check prices, reviews, and availability here. Or, if you prefer to go independently at your own leisure and save some money, you can just purchase the roundtrip train ticket here. Another popular day trip from Interlaken, Schilthorn is another scenic mountain experience, but this time by cable car rather than train. Lower than Jungfraujoch at 2,970 meters, it still offers quite an impressive vista. It may look familiar to you as the panoramic revolving restaurant Piz Gloria was featured in the famous James Bond movie On Her Majesty’s Secret Service. Generally, you get here via a series of cable cars, which start in Stechelberg (near Lauterbrunnen) before heading up to Gimmelwald and Mürren, then onwards to Birg for the final cable car to Schilthorn. You could also hike, though it would take at least 5 hours from Gimmelwald and I wouldn’t recommend it unless you’re insanely fit. 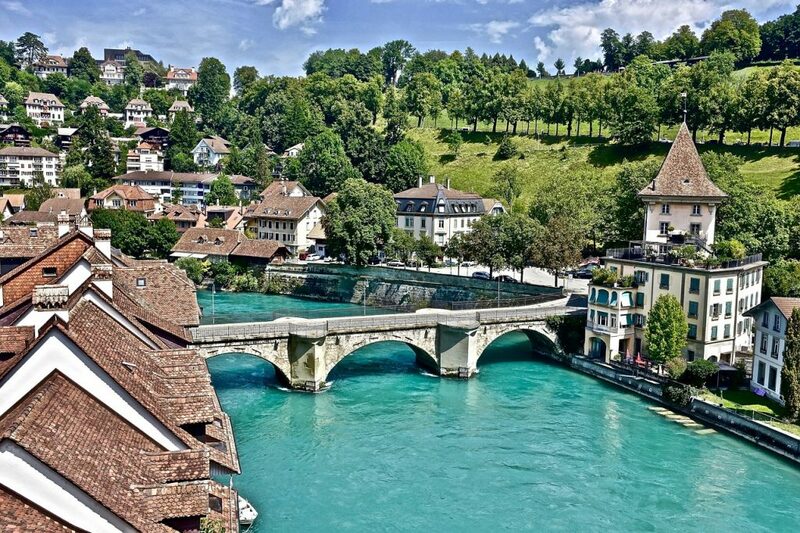 Bern is the capital of Switzerland and the heart of Bernese Oberland, the region that encompasses Interlaken and all the above-mentioned Interlaken day trips. But Bern is quite different, way more of a city whereas the other day trips so far on this post are all either villages or scenic mountains. Bern is famous for its Zytglogge, a medieval 13th century clock that shows that the Swiss obsession with timeliness is not a new phenomenon. There are also several excellent museums, such as the Einstein Museum and the Kunst (Art) Museum, as well as a beautiful Old Town to walk through. Trains from Bern to Interlaken run like, well, clockwork, so it’s quite easy to organize a day trip from Interlaken to Bern independently without the need to spend money on a pricy tour, so it’s a great day trip option for travelers on a budget. One of the two lakes that flank Interlaken is Lake Thun, which is named for the town of Thun on its banks. 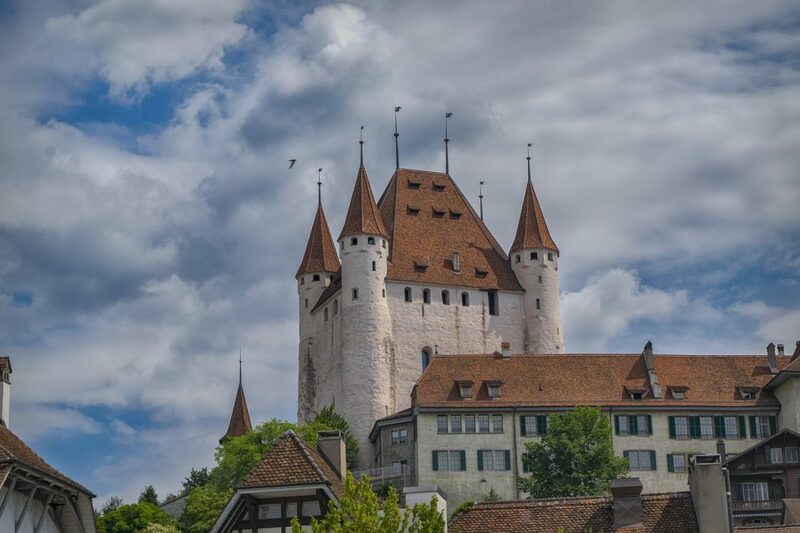 Thun has a gorgeous castle – one of the most beautiful in Switzerland I’d say, after Chillon Castle in Montreux – and is well-worth taking the scenic boat ride from Interlaken to Thun. The castle dates back to the 12th century and is host to a museum which exhibits prehistoric and medieval artifacts from the region. It’s located in the middle of Thun’s picturesque Old Town, which is also worth a wander. Further down Lake Thun, you can also visit another castle, Spiez Castle, so if you are a huge history or castle geek spending a day bouncing around the beautiful sights on Interlaken’s lakes are definitely worth making a day trip out of. Wonderful! Have a great trip!